The Night of the Long Knives (German: Nacht der langen Messer ), also called Operation Hummingbird or, in Germany, the Röhm Putsch (German spelling: Röhm-Putsch), was a purge that took place in Nazi Germany from June 30 to July 2, 1934, when the Nazi regime carried out a series of political extrajudicial executions intended to consolidate Hitler's absolute hold on power in Germany. Many of those killed were leaders of the SA (Sturmabteilung), the Nazis' own paramilitary Brownshirts organization; the best-known victim was Ernst Röhm, the SA's leader and one of Hitler's longtime supporters and allies. 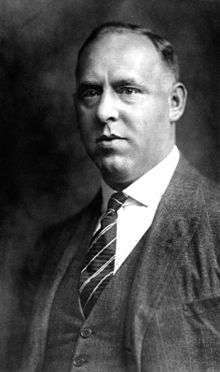 Leading members of the left-wing Strasserist faction of the Nazi Party (NSDAP), along with its figurehead, Gregor Strasser, were also killed, as were establishment conservatives and anti-Nazis (such as former Chancellor Kurt von Schleicher and Bavarian politician Gustav Ritter von Kahr, who had suppressed Adolf Hitler's Munich Beer Hall Putsch in 1923). The murders of Brownshirt leaders were also intended to improve the image of the Hitler government with a German public that was increasingly critical of thuggish Brownshirt tactics. At least 85 people died during the purge, although the final death toll may have been in the hundreds,[lower-alpha 2][lower-alpha 3] and more than a thousand perceived opponents were arrested. Most of the killings were carried out by the Schutzstaffel (SS) and the Gestapo (Geheime Staatspolizei), the regime's secret police. The purge strengthened and consolidated the support of the Reichswehr for Hitler. It also provided a legal grounding for the Nazi regime, as the German courts and cabinet quickly swept aside centuries of legal prohibition against extrajudicial killings to demonstrate their loyalty to the regime. The Night of the Long Knives was a turning point for the German government. It established Hitler as "the supreme justiciar of the German people", as he put it in his July 13, 1934 speech to the Reichstag. Before its execution, its planners sometimes referred to it as Hummingbird (German: Kolibri), the codeword used to send the execution squads into action on the day of the purge. The codename for the operation appears to have been chosen arbitrarily. The phrase "Night of the Long Knives" in the German language predates the massacre and refers generally to acts of vengeance. Germans still use the term Röhm-Putsch to describe the murders, the term given to it by the Nazi regime, despite its unproven implication that the murders were necessary to prevent a coup. German authors often use quotation marks or write about the sogenannter Röhm-Putsch ("so-called Röhm Putsch") for emphasis. President Paul von Hindenburg appointed Hitler Chancellor on January 30, 1933. [lower-alpha 4] Over the next few months, during the so-called Gleichschaltung, Hitler dispensed with the need for the Reichstag as a legislative body[lower-alpha 5] and eliminated all rival political parties in Germany, so that by the middle of 1933 the country had become a one-party state under his direction and control. Hitler did not exercise absolute power, however, despite his swift consolidation of political authority. 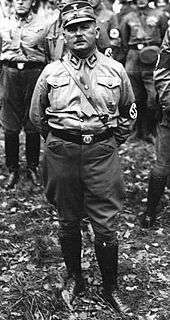 As chancellor, Hitler did not command the army, which remained under the formal leadership of Hindenburg, a highly respected veteran field marshal. While many officers were impressed by Hitler's promises of an expanded army, a return to conscription, and a more aggressive foreign policy, the army continued to guard its traditions of independence during the early years of the Nazi regime. To a lesser extent, the Sturmabteilung (SA), a Nazi paramilitary organisation, remained somewhat autonomous within the party. The SA evolved out of the remnants of the Freikorps movement of the post-World War I years. The Freikorps were nationalistic organisations primarily composed of disaffected, disenchanted, and angry German combat veterans founded by the government in January 1919 to deal with the threat of a Communist revolution when it appeared that there was a lack of loyal troops. A very large number of the Freikorps believed that the November Revolution had betrayed them when Germany was alleged to be on the verge of victory in 1918. Hence, the Freikorps were in opposition to the new Weimar Republic, which was born as a result of the November Revolution, and whose founders were contemptuously called "November criminals". Captain Ernst Röhm of the Reichswehr served as the liaison with the Bavarian Freikorps. Röhm was given the nickname "The Machine Gun King of Bavaria" in the early 1920s, since he was responsible for storing and issuing illegal machine guns to the Bavarian Freikorps units. Röhm left the Reichswehr in 1923 and later became commander of the SA. During the 1920s and 1930s, the SA functioned as a private militia used by Hitler to intimidate rivals and disrupt the meetings of competing political parties, especially those of the Social Democrats and the Communists. Also known as the "brownshirts" or "stormtroopers", the SA became notorious for their street battles with the Communists. The violent confrontations between the two contributed to the destabilisation of Germany's inter-war experiment with democracy, the Weimar Republic. In June 1932, one of the worst months of political violence, there were more than 400 street battles, resulting in 82 deaths. 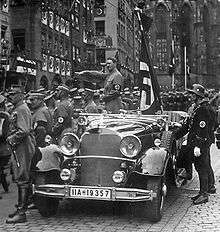 Hitler's appointment as chancellor, followed by the suppression of all political parties except the Nazis, did not end the violence of the stormtroopers. Deprived of Communist party meetings to disrupt, the stormtroopers would sometimes run riot in the streets after a night of drinking. They would attack passers-by, and then attack the police who were called to stop them. Complaints of "overbearing and loutish" behaviour by stormtroopers became common by the middle of 1933. The Foreign Office even complained of instances where brownshirts manhandled foreign diplomats. No one in the SA spoke more loudly for "a continuation of the German revolution", as one prominent stormtrooper put it, than Röhm. [lower-alpha 8] Röhm, as one of the earliest members of the Nazi Party, had participated in the Munich Beer Hall Putsch, an attempt by Hitler to seize power by force in 1923. A combat veteran of World War I, Röhm had recently boasted that he would execute 12 men in retaliation for the killing of any stormtrooper. Röhm saw violence as a means to political ends. He took seriously the socialist promise of National Socialism, and demanded that Hitler and the other party leaders initiate wide-ranging socialist reform in Germany. Despite such hostility between the brownshirts and the regular army, Blomberg and others in the military saw the SA as a source of raw recruits for an enlarged and revitalised army. Röhm, however, wanted to eliminate the generalship of the Prussian aristocracy altogether, using the SA to become the core of a new German military. Limited by the Treaty of Versailles to one hundred thousand soldiers, army leaders watched anxiously as membership in the SA surpassed three million men by the beginning of 1934. In January 1934, Röhm presented Blomberg with a memorandum demanding that the SA replace the regular army as the nation's ground forces, and that the Reichswehr become a training adjunct to the SA. Despite his earlier agreement with Hitler, Röhm still clung to his vision of a new German army with the SA at its core. By early 1934, this vision directly conflicted with Hitler's plan to consolidate power and expand the Reichswehr. Because their plans for the army were mutually exclusive, Röhm's success could only come at Hitler's expense. Moreover, it was not just the Reichswehr that viewed the SA as a threat. Several of Hitler's lieutenants feared Röhm's growing power and restlessness, as did Hitler. As a result, a political struggle within the party grew, with those closest to Hitler, including Prussian premier Hermann Göring, Propaganda Minister Joseph Goebbels, Reichsführer-SS Heinrich Himmler, and Hitler's deputy Rudolf Hess, positioning themselves against Röhm. While all of these men were veterans of the Nazi movement, only Röhm continued to demonstrate his independence from, rather than his loyalty to, Adolf Hitler. Röhm's contempt for the party's bureaucracy angered Hess. SA violence in Prussia gravely concerned Göring, Minister-President of Prussia. Finally in the spring of 1934, the growing rift between Röhm and Hitler over the role of the SA in the Nazi state led the former Chancellor, General Kurt von Schleicher, to start playing politics again. Schleicher criticised the current Hitler cabinet while some of Schleicher's followers such as General Ferdinand von Bredow and Werner von Alvensleben started passing along lists of a new Hitler Cabinet in which Schleicher would become Vice-Chancellor, Röhm Minister of Defence, Heinrich Brüning Foreign Minister and Gregor Strasser Minister of National Economy. The British historian Sir John Wheeler-Bennett, who knew Schleicher and his circle well, wrote that Bredow displayed a "lack of discretion" that was "terrifying" as he went about showing the list of the proposed cabinet to anyone who was interested. Although Schleicher was in fact unimportant by 1934, increasingly wild rumours that he was scheming with Röhm to reenter the corridors of power helped stoke the sense of crisis. Demands for Hitler to constrain the SA strengthened. Conservatives in the army, industry, and politics placed Hitler under increasing pressure to reduce the influence of the SA and to move against Röhm. While Röhm's homosexuality did not endear him to conservatives, they were more concerned about his political ambitions. Hitler for his part remained indecisive and uncertain about just what precisely he wanted to do when he left for Venice to meet Benito Mussolini on June 15. Before Hitler left, and at the request of Presidential State Secretary Otto Meißner, Foreign Minister Baron Konstantin von Neurath ordered the German Ambassador to Italy Ulrich von Hassell — without Hitler's knowledge — to ask Mussolini to tell Hitler that the SA was blackening Germany's good name. Neurath's manoeuvre to put pressure on Hitler paid off, with Mussolini agreeing to the request (Neurath was a former ambassador to Italy, and knew Mussolini well). During the summit in Venice, Mussolini upbraided Hitler for tolerating the violence, hooliganism, and homosexuality of the SA, which Mussolini stated were ruining Hitler's good reputation all over the world. Mussolini used the affair occasioned by the murder of Giacomo Matteotti as an example of the kind of trouble unruly followers could cause a dictator. While Mussolini's criticism did not win Hitler over to acting against the SA, it helped push him in that direction. 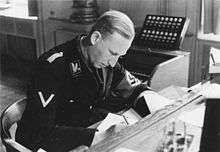 In preparation for the purge both Himmler and Reinhard Heydrich, chief of the SS Security Service, assembled a dossier of manufactured evidence to suggest that Röhm had been paid 12 million Reichsmark (EUR 48.2 million in 2016) by France to overthrow Hitler. Leading officers in the SS were shown falsified evidence on June 24 that Röhm planned to use the SA to launch a plot against the government (Röhm-Putsch). Göring, Himmler, Heydrich, and Victor Lutze (at Hitler's direction) drew up lists of people in and outside the SA to be killed. One of the men Göring recruited to assist him was Willi Lehmann, a Gestapo official and NKVD spy. 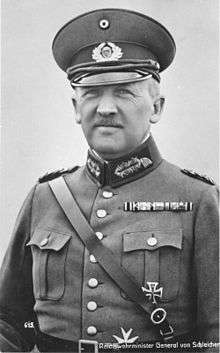 On June 25, General Werner von Fritsch placed the Reichswehr on the highest level of alert. On June 27, Hitler moved to secure the army's cooperation. Blomberg and General Walther von Reichenau, the army's liaison to the party, gave it to him by expelling Röhm from the German Officers' League. On June 28 Hitler went to Essen to attend a wedding celebration and reception; from there he called Röhm's adjutant at Bad Wiessee and ordered SA leaders to meet with him on June 30 at 11h. On June 29, a signed article in Völkischer Beobachter by Blomberg appeared in which Blomberg stated with great fervour that the Reichswehr stood behind Hitler. With Hitler's arrival in Bad Wiessee between 06:00 and 07:00, the SA leadership, still in bed, were taken by surprise. SS men stormed the hotel and Hitler personally placed Röhm and other high-ranking SA leaders under arrest. According to Erich Kempka, Hitler turned Röhm over to "two detectives holding pistols with the safety catch removed", and the SS found Breslau SA leader Edmund Heines in bed with an unidentified eighteen-year-old male SA senior troop leader. Goebbels emphasised the latter in subsequent propaganda justifying the purge as a crackdown on moral turpitude. Both Heines and his partner were shot on the spot in the hotel grounds on the personal order of Hitler. Meanwhile, the SS arrested the other SA leaders as they left their train for the planned meeting with Röhm and Hitler. Although Hitler presented no evidence of a plot by Röhm to overthrow the regime, he nevertheless denounced the leadership of the SA. 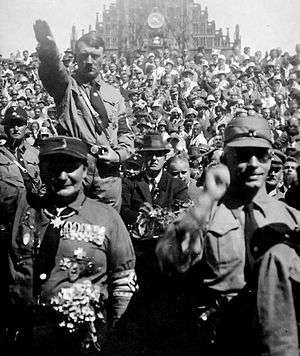 Arriving back at party headquarters in Munich, Hitler addressed the assembled crowd. Consumed with rage, Hitler denounced "the worst treachery in world history". Hitler told the crowd that "undisciplined and disobedient characters and asocial or diseased elements" would be annihilated. The crowd, which included party members and many SA members fortunate enough to escape arrest, shouted its approval. Hess, present among the assembled, even volunteered to shoot the "traitors". Joseph Goebbels, who had been with Hitler at Bad Wiessee, set the final phase of the plan in motion. Upon returning to Berlin, Goebbels telephoned Göring at 10:00 with the codeword Kolibri to let loose the execution squads on the rest of their unsuspecting victims. The regime did not limit itself to a purge of the SA. Having earlier imprisoned or exiled prominent Social Democrats and Communists, Hitler used the occasion to move against conservatives he considered unreliable. This included Vice-Chancellor Papen and those in his immediate circle. In Berlin, on Göring's personal orders, an armed SS unit stormed the Vice-Chancellery. Gestapo officers attached to the SS unit shot Papen's secretary Herbert von Bose without bothering to arrest him first. The Gestapo arrested and later executed Papen's close associate Edgar Jung, the author of Papen's Marburg speech; they disposed of his body by dumping it in a ditch. The Gestapo also murdered Erich Klausener, the leader of Catholic Action, and a close Papen associate. Papen was unceremoniously arrested at the Vice-Chancellery, despite his insistent protests that he could not be arrested in his position as Vice-Chancellor. Although Hitler ordered him released days later, Papen no longer dared to criticise the regime and was sent off to Vienna as German ambassador. Among others, a charming fellow [named] Karl von Spreti, Röhm's personal adjutant. He held the same position with Röhm as I held with Himmler. [He] died with words "Heil Hitler" on his lips. We were close personal friends, we often dined together in Berlin. He lifted his arm in the Nazi salute and called out "Heil Hitler, I love Germany". Several leaders of the disbanded Catholic Centre Party were also murdered in the purge. The Party had generally been aligned with the Social Democrats and Catholic Church during the rise of Nazism, being critical of Nazi ideology, but voting nonetheless for the enabling act of 1933. Röhm was held briefly at Stadelheim Prison[lower-alpha 9] in Munich, while Hitler considered his future. In the end, Hitler decided that Röhm had to die. On July 1, at Hitler's behest, Theodor Eicke, Commandant of the Dachau concentration camp, and his SS adjutant Michel Lippert visited Röhm. Once inside Röhm's cell, they handed him a Browning pistol loaded with a single bullet and told him he had ten minutes to kill himself or they would do it for him. Röhm demurred, telling them, "If I am to be killed, let Adolf do it himself." Having heard nothing in the allotted time, they returned to Röhm's cell at 14:50 to find him standing, with his bare chest puffed out in a gesture of defiance. Lippert then shot Röhm three times, killing him. In 1957, the German authorities tried Lippert in Munich for Röhm's murder. Until then, Lippert had been one of the few executioners of the purge to evade trial. Lippert was convicted and sentenced to 18 months in prison. In this hour I was responsible for the fate of the German people, and thereby I became the supreme judge of the German people. I gave the order to shoot the ringleaders in this treason, and I further gave the order to cauterise down to the raw flesh the ulcers of this poisoning of the wells in our domestic life. Let the nation know that its existence—which depends on its internal order and security—cannot be threatened with impunity by anyone! And let it be known for all time to come that if anyone raises his hand to strike the State, then certain death is his lot. Concerned with presenting the massacre as legally sanctioned, Hitler had the cabinet approve a measure on July 3 that declared, "The measures taken on June 30, July 1 and 2 to suppress treasonous assaults are legal as acts of self-defence by the State." Reich Justice Minister Franz Gürtner, a conservative who had been Bavarian Justice Minister in the years of the Weimar Republic, demonstrated his loyalty to the new regime by drafting the statute, which added a legal veneer to the purge. [lower-alpha 10] Signed into law by Hitler, Gürtner, and Minister of the Interior Wilhelm Frick, the "Law Regarding Measures of State Self-Defence" retroactively legalised the murders committed during the purge. Germany's legal establishment further capitulated to the regime when the country's leading legal scholar, Carl Schmitt, wrote an article defending Hitler's July 13 speech. It was named "The Führer Upholds the Law". Almost unanimously, the army applauded the Night of the Long Knives, even though the generals Kurt von Schleicher and Ferdinand von Bredow were among the victims. 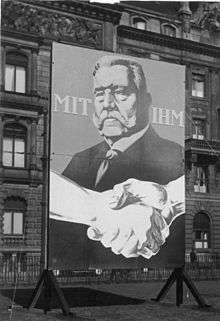 The ailing President Hindenburg, Germany's highly revered military hero, sent a telegram expressing his "profoundly felt gratitude" and he congratulated Hitler for "nipping treason in the bud". 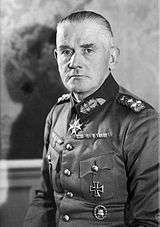 General von Reichenau went so far as to publicly give credence to the lie that Schleicher had been plotting to overthrow the government. In his speech to the Reichstag on July 13 justifying his actions, Hitler denounced Schleicher for conspiring with Ernst Röhm to overthrow the government; Hitler alleged both were traitors working in the pay of France. Since Schleicher was a good friend of the French Ambassador André François-Poncet, and because of his reputation for intrigue, the claim that Schleicher was working for France had enough surface plausibility for most Germans to accept it. François-Poncet was not declared persona non grata as would have been usual if an Ambassador were involved in a plot against his host government. The army's support for the purge, however, would have far-reaching consequences for the institution. The humbling of the SA ended the threat it had posed to the army but, by standing by Hitler during the purge, the army bound itself more tightly to the Nazi regime. One retired captain, Erwin Planck, seemed to realise this: "if you look on without lifting a finger," he said to his friend, General Werner von Fritsch, "you will meet the same fate sooner or later." Another rare exception was Field Marshal August von Mackensen, who spoke about the murders of Schleicher and Bredow at the annual General Staff Society meeting in February 1935 after they had been rehabilitated by Hitler in early January 1935. In late 1934–early 1935, Werner von Fritsch and Werner von Blomberg, who had been shamed into joining Hammerstein and Mackensen's rehabilitation campaign, successfully pressured Hitler into rehabilitating Generals von Schleicher and von Bredow. Fritsch and Blomberg suddenly now claimed at the end of 1934 that as army officers they could not stand the exceedingly violent press attacks on Schleicher and Bredow that had been going on since July, which portrayed them as the vilest traitors, working against the Fatherland in the pay of France. In a speech given on January 3, 1935 at the Berlin State Opera, Hitler stated that Schleicher and Bredow had been shot "in error" on the basis of false information, and that their names were to be restored to the honour rolls of their regiments at once. Hitler's speech was not reported in the German press, but the army was appeased by the speech. 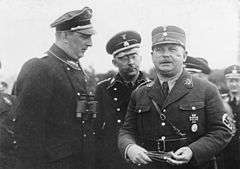 However, despite the rehabilitation of the two murdered officers, the Nazis continued in private to accuse Schleicher of high treason. During a trip to Warsaw in January 1935, Göring told Jan Szembek that Schleicher had urged Hitler in January 1933 to reach an understanding with France and the Soviet Union, and partition Poland with the latter, and Hitler had Schleicher killed out of disgust with the alleged advice. During a meeting with Polish Ambassador Józef Lipski on May 22, 1935, Hitler told Lipski that Schleicher was "rightfully murdered, if only because he had sought to maintain the Rapallo Treaty". The statements that Schleicher had been killed because he wanted to partition Poland with the Soviet Union were later published in the Polish White Book of 1939, which was a collection of diplomatic documents detailing German–Polish relations up to the outbreak of the war. Former Kaiser Wilhelm II, who was in exile in Doorn, Netherlands, was horrified by the purge. He said, "What would people have said if I had done such a thing?". Hearing of the murder of former Chancellor Kurt von Schleicher and his wife, he also commented, "We have ceased to live under the rule of law and everyone must be prepared for the possibility that the Nazis will push their way in and put them up against the wall!" Hitler named Victor Lutze to replace Röhm as head of the SA. Hitler ordered him, as one prominent historian described it, to put an end to "homosexuality, debauchery, drunkenness, and high living" in the SA. Hitler expressly told him to stop SA funds from being spent on limousines and banquets, which he considered evidence of SA extravagance. Lutze did little to assert the SA's independence in the coming years, and the SA lost its power in Germany. Membership in the organisation plummeted from 2.9 million in August 1934 to 1.2 million in April 1938. The Night of the Long Knives represented a triumph for Hitler, and a turning point for the German government. It established Hitler as "the supreme leader of the German people", as he put it in his July 13 speech to the Reichstag. Later, in April 1942, Hitler would formally adopt this title, thus placing himself de jure as well as de facto above the reach of the law. Centuries of jurisprudence proscribing extrajudicial killings were swept aside. Despite some initial efforts by local prosecutors to take legal action against those who carried out the murders, which the regime rapidly quashed, it appeared that no law would constrain Hitler in his use of power. [lower-alpha 12] The Night of the Long Knives also sent a clear message to the public that even the most prominent Germans were not immune from arrest or even summary execution should the Nazi regime perceive them as a threat. In this manner, the purge established a pattern of violence that would characterise the Nazi regime. Röhm was purged from all Nazi propaganda, such as the film of the 1933 Nuremberg rally, although a print copy of the motion picture by film director Leni Riefenstahl survived and was found in the United Kingdom many years later. ↑ Papen, nonetheless, remained in his position although people quite close to him were murdered. ↑ "At least eighty-five people are known to have been summarily killed without any formal legal proceedings being taken against them. Göring alone had over a thousand people arrested." Evans 2005, p. 39. ↑ "The names of eighty-five victims [exist], only fifty of them SA men. Some estimates, however, put the total number killed at between 150 and 200." Kershaw 1999, p. 517. ↑ In the November 1932 parliamentary elections, the Nazi Party won 196 seats in the Reichstag out of a possible 584. The Nazis were the largest party in the legislature but were still considerably short of a majority. ↑ "The most general theory—that National Socialism was a revolution of the lower middle class—is defensible but inadequate." Schoenbaum 1997, pp. 35–42. ↑ "But in origin the National Socialists had been a radical anti-capitalist party, and this part of the National Socialist programme was not only taken seriously by many loyal Party members but was of increasing importance in a period of economic depression. How seriously Hitler took the socialist character of National Socialism was to remain one of the main causes of disagreement and division within the Nazi party up to the summer of 1934." Bullock 1958, p. 80. ↑ The quote is attributed to Breslau SA Chief Edmund Heines. Frei 1987, p. 126. ↑ Coincidentally, Hitler had been incarcerated at Stadelheim Prison for about five weeks following the Nazi's disruption of an opposing party's political rally in January 1921. ↑ "It was plain that there was wide acceptance of the deliberately misleading propaganda put out by the regime." Kershaw 2001, p. 87. ↑ "After the 'Night of the Long Knives,' [Reich Minister for Justice Franz Gürtner] nipped in the bud the attempts of some local state prosecutors to initiate proceedings against the killers." Evans 2005, p. 72. 1 2 Evans 2005, p. 39. 1 2 Wheeler-Bennett 1967, pp. 315–316. 1 2 3 4 5 Wheeler-Bennett 1967, p. 317. 1 2 3 4 Wheeler-Bennett 1967, p. 318. 1 2 Evans 2005, p. 31. ↑ O'Neill 1967, pp. 72–80. 1 2 3 4 Shirer 1960, p. 221. 1 2 3 Kershaw 1999, p. 514. 1 2 Evans 2005, p. 32. 1 2 Evans 2005, p. 36. ↑ "The German Churches and the Nazi State". United States Holocaust Memorial Museum. Retrieved 6 June 2015. ↑ Kershaw 1999, p. 519. 1 2 3 4 5 Wheeler-Bennett 1967, p. 327. ↑ Höhne 1970, pp. 113–118. ↑ Schwarzmüller 1995, pp. 299–306. 1 2 Wheeler-Bennett 1967, p. 328. 1 2 3 4 5 6 Wheeler-Bennett 1967, p. 329. 1 2 Wheeler-Bennett 1967, p. 336. 1 2 Wheeler-Bennett 1967, p. 337. 1 2 Kershaw 1999, p. 520. Kempka, Erich (October 15, 1971). "Erich Kempka interview". Library of Congress: Adolf Hitler Collection, C-89, 9376-88A-B. "Röhm-Putsch" (in German). Deutsches Historisches Museum (DHM), German Historical Museum. Retrieved 2012-05-15. The Waffen-SS. Gladiators of World War II. World Media Rights. Retrieved 5 June 2015. Mau, Herman (1972). "The 'Second Revolution'—June 30, 1934". In Holborn, Hajo. Republic to Reich: The Making of the Nazi Revolution. New York: Pantheon Books. ISBN 978-0-394-47122-8.